If you want to run endurance races, it really does help if you like running. 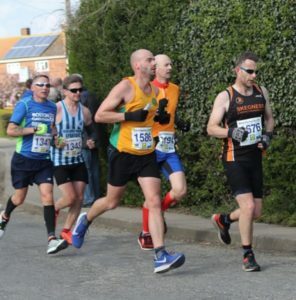 If you want to run this event, you have to be happy with your own company as well for after starting in the market square the course soon leaves the town and enters the flat Lincolnshire Fens. If you want to see vegetables growing, then this is the place. The landscape is not entirely empty however as there are pockets of supporters dotted along the course giving welcome relief but the woman with the rattle must have appeared about half a dozen times at different places en-route. Race day did not start auspiciously for looking out of the window at 06:30 whilst making porridge the skies were leaden and then it rained which was not on the forecast which had been studied intently for the previous week. Only a short sharp shower however followed by the sight of a flock of geese flying overhead in perfect v-formation. An good omen perhaps? The weather was still an issue though with an ill wind from the North East so it was into the breeze on the way out with a following wind for much of the way back although, as the route negotiated the vast rectangular fields, there were the occasional sections where it turned into the wind again. There is also a half marathon which starts 10 minutes after the marathon; the two lads who passed us at about four miles were really tonking it (the winner finished in 73.06) although the ones that we passed on the way back to Boston were travelling somewhat more sedately. Full result are here Boston Marathon UK Results 2019. Winners were Phil Martin (Peterborough) in 2:34:14 and Hannah Peel (Sheffield Tri Club) in 3:09:32. Long Distance Strider Nick Booker had run Manchester Marathon the week before so, not unsurprisingly, not the time that he wanted but he was first M50. This is nearly a sprint for Nick though who was recorded as saying “Wow 26 miles are hard on the road, give me 30 miles on the trails any day”. Although not wanting to talk about his run James confessed that he read the wind poorly and paid for it from mile ten. A pb for Gillian however which is sound given the conditions even if she really wanted to run sub 3:30. The remaining club member was disappointed that he didn’t get a negative split which would have been a first at this distance for him. James Smith is flying along at Butterwick, four miles into the race. The number of competitors sporting gloves indicates the conditions with a “feels like” temperature of four degrees at the 09:00 start. Pancake flat, although the wind is always likely to be an issue in this part of the world with barely a hedge or tree to provide shelter, this race is a good one. Efficient organisation, chip timing, ample water stations (no gels) plus t-shirt and gong if that’s your thing. With the half starting ten minutes later meant that there was little issue with conflicting pace between the two fields as you could always tell who was in which event. Overnight accommodation in the halls at Boston College was a bargain at £25 to save a two hour journey on the morning of the race. This was available for a shower and to recover after the event although not so happy being on the top floor as stairs can be an issue – especially coming down. Put this one on your agenda if you can’t get into London or dislike the razzamatazz of big city marathons. 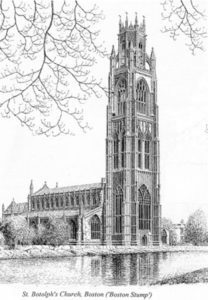 Completed between 1510 and 1520 in the perpendicular style, the Boston Stump is the affectionate nickname for the tower of St Botolph’s Church, Boston. At 83m high it is one of the tallest Medieval towers in the country and is visible from miles around topped by a lantern which was once lit as a sea mark for sailors approaching the port. First noticed on the horizon with about five miles to go it didn’t seem to get any closer as we tacked our way towards the finish.